For individual store phone numbers call: 304-765-3300 or click above on the Stores Tab. We are located in the center of West Virginia at the geographical center of the state. 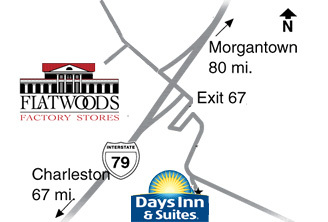 Flatwoods Exit 67 on Interstate 79 and across the highway from the Flatwoods Days Inn & Suites and Conference Center.